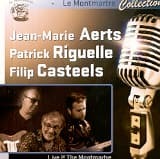 Jean-Marie Aerts, Patrick Riguelle and Filip Casteels; three gentlemen, three generations of music from Belgium. They each earned their tracks with bands like TC Matic, Arno, JMX, De Laatste Showband, El Fish, consequently they met each other before. The song "Catwalk" (Aerts/Casteels) led to start of the trio. 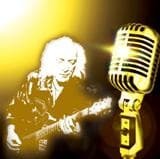 The Blues, their common passion, is the glue for the repertoire they perform; own compositions and covers, known and obscure, old and new, influenced by all kinds of styles. They play clubs since the beginning of 2010. All three they sing and play the guitar. 3 personalities that fit well together bring a variety of music on volume 2 in the series of live recordings at the Brussels club LE MONTMARTRE. Recorded Live on the 6th of November 2010. Volume 4 in the live series recorded at this legendary Brussels club! Recordee on May 1st, 2011 and featuring Jean-Pierre Froidebise - vocals, guitars, loops; Rene Stock - bass, doublebass; Marcus Weymaere - drums. volume 3 in the lie series recorded at this legendary Brussels club! This time around it's the up and coming young belgian blues act Ganashake who stirred up some dust last year with their self-titled debut cd.! Kelly's Lot (USA) plays Roadhouse Blues with an edge! Acoustic or Electric, Kelly's Lot creates an energy that is engaging and contagious. Recorded live at the MOntmartre club in Brussels, Belgium.